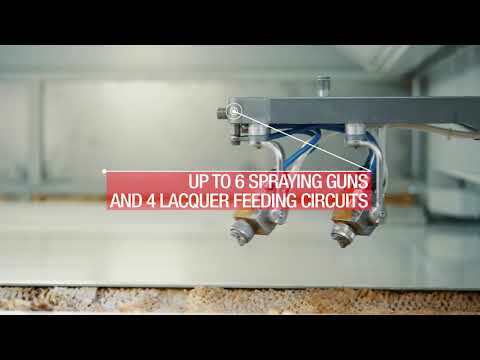 ROCTRE is the high-productivity two-arm oscillating spray machine ideal for matt and gloss finishes. Roctre is also able to apply large quantities of paint. Roctre features a reading barrier for precision scanning of the shape of incoming workpieces, optimising spraying trajectories and paint consumption. Roctre is equipped with two spraying arms. On request it can be fitted with quick-coupling arms for fast, easy product change and spray gun cleaning. Roctre can be equipped with a two-stage dry filter system or water curtain filtration systems. In the dry filter configuration, overspray is sucked through two-stage filters with a large surface area, with easy dismantling and access for simpler maintenance. Water filters are recommended for manufacturers operating with high productivity on several shifts, or who perform specific treatments such as gloss finishes. Roctre is equipped with a patented "Airsphere" air diffusion Plenum, an innovative method for controlling the air flow inside the machine for maximised spraying quality and higher transfer-efficiency. Roctre features a carbon fibre belt (CFB) conveyor system, which guarantees optimal paint recovery, quick cleaning and maintenance, and no overspray on the underside of the panel. The carriage is equipped with a patented high-precision automatic belt centring system. The conveyor system allows independent speed adjustment, allowing perfect synchronisation between feed and exit belts. Paint is recovered by a patented system with a counter-turning roller, while the rest of the system ensures perfect belt cleaning. Solvent consumption and cleaning times are minimised. The FLEX version (with belt recovery) has been developed for users who paint small batches with frequent colour changes. Roctre can be completed with a protective enclosure that maximises this machine's performance in quality terms. OVERSPRAY FILTRATION: Dry filters or water curtains. ROCTRE has been developed to deliver the highest performances in terms of quality and productivity. It can provide the basis for complex systems, especially to meet high-volume production needs. Ideal for matt and gloss finishes (including high gloss).